Is there a way to reference the specific slides that have the answer when reviewing a quiz? Most important: When reviewing a quiz and the answer is wrong, add a link to take the user to the specific slide where the correct info is. Nice to have: Same as above but also for correct answers. Try using a lightbox slide! Lightboxes make it easy for learners to reference a slide without losing their current place in the course. The community may have other ideas for you, so I'm excited to see what they'll share here! I have a question: I was thinking of having a link to make the lightbox appear, but the link should only be visible when the learner reviews the quiz, not when they take the quiz the first time (or if they retake the quiz). Have you looked at setting the link to an initial state of hidden and then triggering the state change based on the learner clicking Review? If you've got your .story file started, you can share it here and then we can take a look at it and offer some help! I am unable to share my .story due to the sensitive nature of the material. 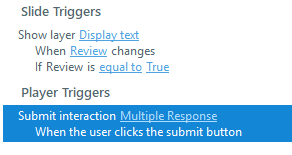 I understand what you are proposing, except I am unclear how the trigger will 'know' that the user reached the quiz/slides by clicking 'Review'. Would I use variables for this? i.e. increment a variable (set to 0) to greater than 0 when the user clicks Review. Then the trigger on the quiz slides will check the variable to see if it is greater than 0, and if it is, the link will display? If 'Retry' was clicked, then set the variable to 0? The trigger will not display the link if the variable is 0. I noticed that the lightbox slide does not include the left-side menu. Is there a way to have the lightbox slide display it? I have the narration transcript in the menu, so it should be displayed. If not, I guess I will need to stop using the Lightbox feature and instead display the slide (and Menu) in a layer? If you need the player features, such as the menu/notes, then I would advise utilizing slides/layers vs. a lightbox slide as you mentioned. The lightbox slide is just meant as a 'pop-up' and you can read more about them here. Sorry for all the questions, but I am stuck...again! The variable (I used T/F like you mentioned) works, as my reference changes to true on the correct condition. So I want to show a layer (Display text) that has a link to another layer when var is true. I cannot get the 'Display text' layer to show on true. The link in 'Display text' works, as when I paste it onto the Base layer it will show the correct layer. I just need to be able to access it on 'Display text' (so it is only showing when the variable 'Review' is true). Based on what I'm seeing here, I'd adjust the trigger to have the 'when' set to when the timeline starts vs when the variable adjusts as that's probably not happening on this slide. So, Show layer x when timeline starts if Review is equal to true. The variable is changing, as a reference text variable shows 'True' when the quiz is reviewed (as it should). Your suggestion would have the layer show as soon as the slide loads, that is not what I want. The user should have the option to view the related slide (Display text layer) when reviewing. Gotcha Sanju. Just trying to envision what you'd like since I cannot see the file. How is the user choosing to view the slide? Is that a button click? The when could be on that 'click' as well. Any chance you could share a few slides and remove the confidential info so that we can help you further? OK, I attached the problem question slide and the Results page. 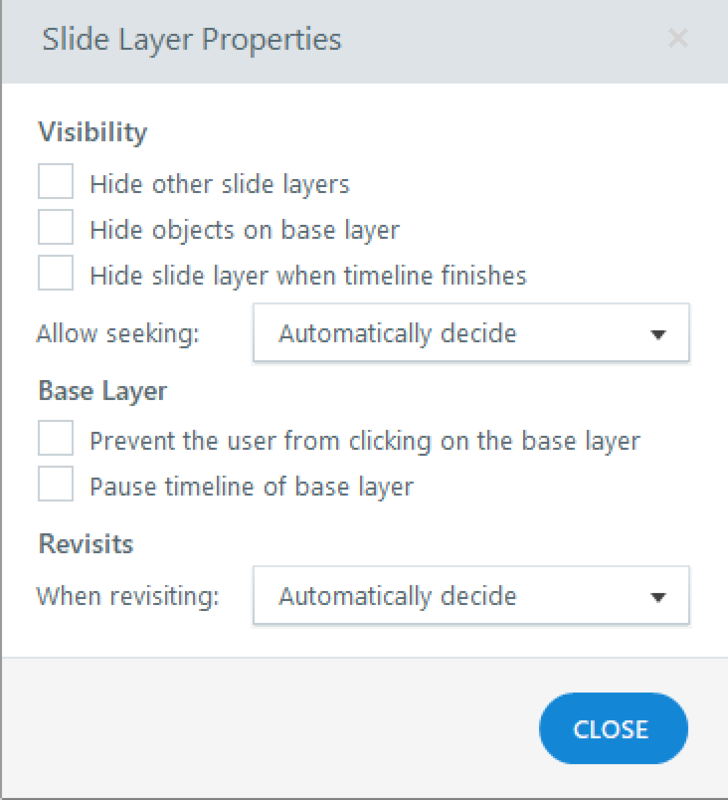 Question slide - 'Review Slide - Base layer': test link to show what I want when the Review variable is True and user clicks the link (on base layer for testing). 'False' is the reference variable, to show what is happening with the T/F variable. - reference variable is True (how it should be), but the 'Review Slide' link on another layer ('Display text') is not showing up. Here are my modifications to show what I was referring to. Ohhhhh, I misunderstood you before. Thanks so much, looks like this will work perfectly!!!! EDIT: Is there a trick to having the 'Review slide' link (Display text layer) stay onscreen after the user clicks the 'X' to close the reference slide (Slide 1.4 layer)? So glad Sanju :) Thanks for your patience! Thanks! You are truly a lifesaver! I appreciate all your help, and for staying with me on these questions!!! "Hi Sanju, Sure! Be sure that you deselect the setting to 'Hide ot..."
"Thanks Sanju! Here are my modifications to show what I was referri..."
"If you need the player features, such as the menu/notes, then I wou..."